The British Museum London has to be one of the best and largest collections of ancient items from around the world for the public to view free of charge anywhere. It is quite simply a stunning museum and no visit to London would be complete without a visit to this giant of London museums. I have been coming here all my life and I can safely say that I still have not seen everything there is to see and that every time I visit I rediscover items I have known of old and new and exciting additions to the collections. So for anyone who is visiting the British museum London for the first time it can seem quite daunting at first as to where do you begin as you enter through the grand doors into the main entrance. There are several ways you can explore the museum for yourself. You can either decide to just wander around and see what you find, you can buy a guide book or audio tour or you may want to visit items with a specific interest to yourself. 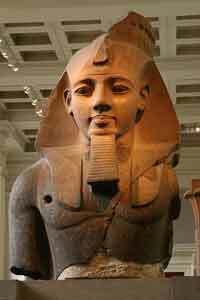 In the main Egyptian statue hall stands a giant torso of the great pharaohs Ramesses the II. It comes from Thebes in Egypt and was created c 1270 BC by the pharaoh for one of his temples. It was removed from Egypt and brought to London in around 1816 and has been wowing visitors since that time. The statue is made from granite and weighs around 7 tons and has unfortunately been damaged in the past when it was first removed from its original resting place. Even with the damage this remains one of the most awe inspiring statues in the British museum London and has to be seen to experience its full beauty and grandeur. Room 4 Ground floor - In the same hall stands the Rosetta stone. This has to be one of the most viewed items in the British museum London and you will discover it constantly surrounded by visitors, so you will have to be either patient or a little pushy to get a good view for yourself, but it is worth the effort. 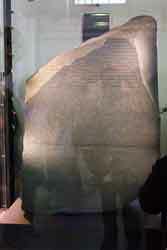 This stone played a very important role in opening up the writings of the ancient Egyptians via their hieroglyphics. Without it we may never have discovered how to read them and so get an insight into the peoples of that civilisation. On the stone you will see three sets of inscription, hieroglyphics, demotic and Greek. They all say the same thing and so from this, scholars were able to decipher the Hieroglyphic symbols. Room 24 Ground Floor - In room 24 you will discover one of the human figures discovered on Easter Island. These figures are known as moai and they are thought to represent or commemorate important people in the people of that islands history and date back to around 1000AD. The statue I think is very striking in its natural state of black basalt but was originally painted red and white but this came off during its transportation via the sea in 1868. On the reverse of the statue you will see beautiful carving which was added later during 1550 when the birdman cult was taking hold on the island. Room 40 Upper Floor - On the second floor in room 40 you will find the Lewis chessman. These stylised figures were found on the Isle of Lewis, Outer Hebrides, Scotland but it is thought they may have been made in Scandinavia around AD 1150. These chess pieces are rather a mysterious find as no one seems to know for sure where they came from and how and why they were buried. It has been thought that the pieces were being taken from Norway to island by a merchant; this is because the pieces make up four separate sets. I love these figures they are so wonderfully decorated and are a little comical in their appearance. They are made from walrus ivory and whales' teeth which gives them an even more unusual appearance. The Sutton Hoo helmet was a very rare find of a medieval period helmet. It was found with other treasure in a long boat burial in York in 1939. 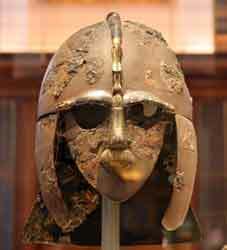 Unlike other helmets the Sutton Hoo helmet has a face plate too which even has a moustache like motif on the upper lip. Although the helmet was badly damaged in the burial chamber it has been restored, as well as a replica of how it would have originally looked. They can be seen side by side at the museum and they are really are a great example of medieval craftsmanship as well as an insight into the culture of the people of the time. 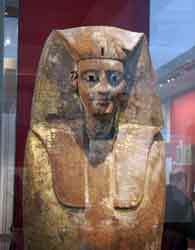 The British museum London is of course also known for its fantastic collection of mummies. This is another very popular area for visitors so go early to get the best view of the gallery. Within this gallery you will find some fantastic examples of mummification and the decoration used to commemorate and illustrate the person contained in the coffin. You will also see mummified cats and birds that were revered as gods at the time. The wide variety of coffins and artefacts will engross you for ages and so don't be surprised if you find yourself in this one gallery for a few hours. It is truly fascinating and educational and a definite stop on your exploration of the British museum London.